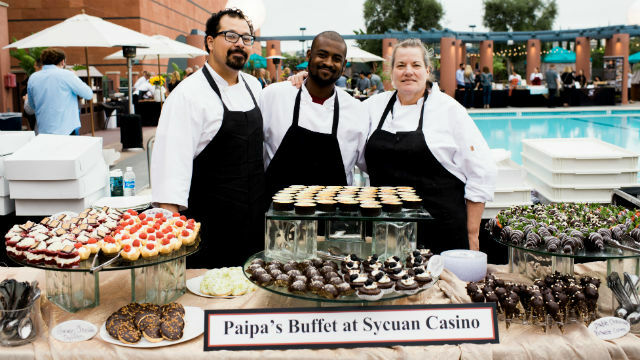 More than 50 San Diego chefs will be offering tasting samples of their cuisine at the 27th annual Mama’s Day benefit on Friday evening. Guests will enjoy food, live music from Bonnie Foster Productions, and fun throughout the evening from 5:30 p.m. to 9:30 p.m. at the Hyatt Regency La Jolla at Aventine. The fundraising event, held annually on the Friday evening before Mother’s Day, benefits Mama’s Kitchen‘s mission to provide food for San Diegans suffering from HIV, cancer and other critical illnesses. Last year the event raised nearly $200,000, and the goal for this year is $215,000 — enough to provide 73,000 meals. Presented by Nordstrom and hosted by Sycuan Casino, tickets are available for $150 per person and $175 at the door. Premium VIP tickets are also available and include a private cooking presentation by Sam “The Cooking Guy” Zien and a performance from the San Diego Gay Men’s Chorus.